The Kickapoo Baptist Church was organized in the summer of 1874 under two live oak trees near present-day Baptist Cemetery. The organizing presbytery consisted of Elder John Lockhart, Elder Joseph Newton Chandler, and Elder Christian. The Kickapoo Baptist Church joined the Brazos Baptist Association at an early date. When the Erath County Baptist Association was organized in 1886, the church joined that association. The congregation was affiliated with the Southern Baptist Convention. The exact date of the original affiliation is unknown. George W. Elliott was ordained a deacon by the church in 1889. He was the first deacon ordained by Kickapoo Baptist Church. He was licensed to preach the gospel by the congregation in 1890. During 1892, Brother George Jefferson was licensed to preach; Henry Yeats was ordained as a deacon the same year. October 1894 was an important time in the life of the church. The congregation voted to move into Lipan proper and meet in the school building for an indefinite time. In 1895 the old church building near Baptist Cemetery was sold so a new building could be constructed in Lipan. Thomas D. Stell was ordained as a deacon in 1896. Minutes of the church records from October 1898 to September 1907 were lost; sometime during this period the name of the church was changed to Lipan Missionary Baptist Church. Brother Lee Harrison was licensed to preach in 1909. He was ordained to preach during October of 1911; the charge was given by Brother W.L. Brandon. During October of 1912, Bro. Layette Nipp was ordained to preach; Bro. Dan Price gave the charge. Will Black and Ben Cook were ordained to the office of deacon during July of 1919; Brother Tolbert gave the charge. In January of 1923, the church began to plan for a new building; the projected cost was $5,000. During December of 1923, T.E. Petty, Mal Huffstutler, and Alonzo P. Campbell were ordained as deacons. The actual construction of the building began in 1927; construction was completed in 1928. The building was constructed of concrete mixed by hand. L.C. Smith and D.C. Baker were ordained as deacons in November of 1937. Sometime between 1938 and 1940, the church withdrew from the Erath Baptist Association and joined the Paluxy Baptist Association. The church building was plastered both inside and outside in 1940. Six Sunday school rooms were added to the building in 1941. Harold Dobbs was ordained to preach the gospel in 1941. The charge was given by Bro. Jimmy Dobbs who was both the pastor of the church and father of the newly ordained preacher. The church built a parsonage immediately behind the church building in March of 1945. Cost of the parsonage was $3,000. The exact date is not known, but sometime about 1950 the congregation became known as First Baptist Church of Lipan. The church added an indoor heated baptistery in 1951. The baptistery scene was painted by Bernice Hood. On November 16, 1952 Joe Gresham, Eugene McPherson, and Melvin Tipton were ordained as deacons. The charge was given by Brother Todd. W.H. Baldree and Gaston Grogan were ordained as deacons on January 22, 1956; the charge was given by Brother Dan. Joe Addison and Addison Brothers contracted to build an education building on the south side of the Sunday school rooms in November of 1960. A fellowship hall and kitchen were also added. The addition was completed in the spring of 1961. The congregation began plans in December of 1962 to build a new auditorium. A loan was secured in January of 1963. Brother Howard Ramsey, pastor at the time, drew the plans. A modern auditorium with a new heating and cooling system, new pews, carpeting, new baptistery, additional Sunday school rooms, and new office space were completed during 1963. Roland Renner was licensed to preach in 1974 during the ministry of Brother Dale Cartwright. First Baptist Church celebrated its 100th Anniversary in the summer of 1974. Many former and current members joined together for an outstanding celebration. In 1979, during the ministry of Brother Jack Moore, Billy Parks, Waldo Chandler, and Dwayne Tarpley were ordained as deacons. In February of 1979, the church voted to build a new parsonage one mile north of town on the Dennis Highway; Ted and Jerrye Sears donated the land for the parsonage. The projected cost of the 2,400 square foot parsonage (including garage) was $55,000. James Addison was elected to serve as chair of the parsonage committee. Many members made pledges to the parsonage building fund. With the congregation acting as its own contractor, Melvin Tarpley signed the Mechanics Lien. Construction began in July of 1979. The new parsonage was completed in January of 1980. The first occupants were Pastor and Mrs. Jack Moore, plus their daughter Connie. They moved into the parsonage during February of 1980. The final cost of the parsonage was $52,500. This was $2,500 below the projected cost. Those who made pledges made their contributions by the time the parsonage was completed. The church secured a $22,000 loan for ten years. The Fleming Foundation of Fort Worth made several gifts of $1,000; the Walsh Foundation of Fort Worth also made a $1,000 gift. Members of the congregation gave additional gifts. The entire loan was paid in full in December 1983; this was only three years and ten months after the loan was secured. The auditorium was refurbished during the 1980's. New carpet, a new sound system, new baptistery, pew cushions, and other items were updated. Additional Sunday school rooms, nursery, and a new fellowship hall and kitchen were added. 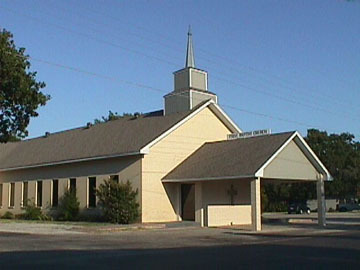 The congregation of First Baptist Church began participating in the Community Worship Services during 1988. The first service was held under the Tabernacle. Ned Tipton, Richard Ator, Gene Taylor, and Kevon Ward were ordained as deacons on February 26, 1989 during the ministry of Brother Tom Couric. The auditorium of First Baptist Church was rebuilt. A new entrance was added. New windows, choir loft, pews, carpet, pew cushions, sound system, and baptistery were added. The church office was relocated to another part of the building.